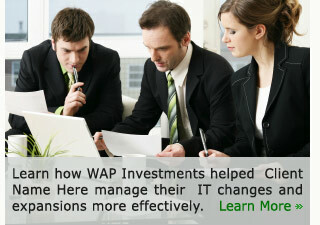 WAP Investments is a 5 year old full-service IT management consulting firm, providing value-added, technology solutions that helps companies maintain leadership positions in their markets and grow by improving cost management and their overall competitiveness. Our solutions products and services include IT management consulting, Technology, design, systems integration, enterprise, ISP, ASP, MSP and telephony and infrastructure. Establishing the Business and Technology platform and or spring board necessary for continuing the profitable growth while helping our customers become more agile and profitable.